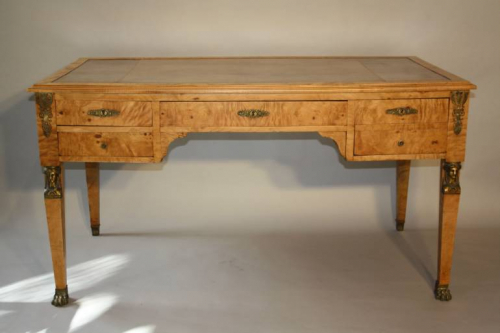 A lovely pale burr walnut veneer Empire revival desk with replaced tan leather top. Drawers to front only with secret compartment. Lockable. The back is finished very nicely also. Elegant ormolu mounts. Additional writing tablets can be pulled out from each end - these are 30cm each. French c1920.